Outdoor garden weddings are very popular at the Schedel Arboretum & Gardens. Whether an intimate gathering for 20 or a lavish event for 300, just the right vista will be found on the beautiful 17 acre garden estate. 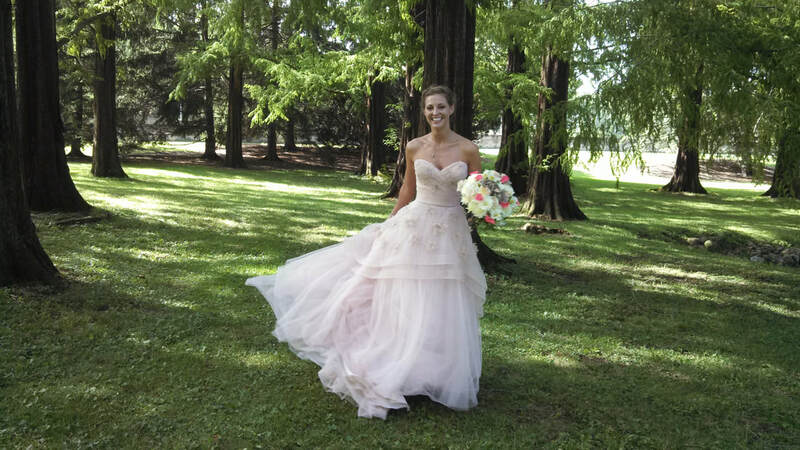 Both ceremonies and receptions may be held on the grounds. 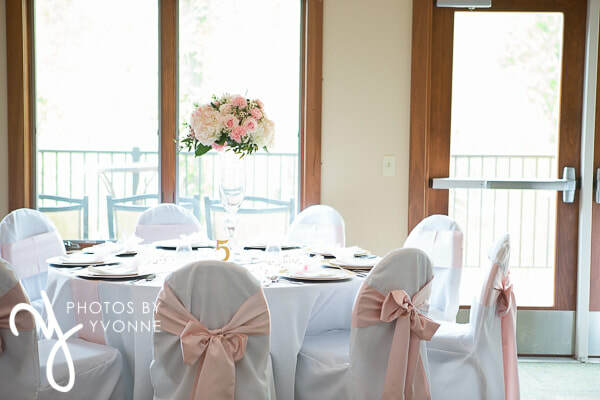 Indoor reception space is available for up to 90 guests depending on specific needs. Larger events are held under event tents in the lower level gardens. 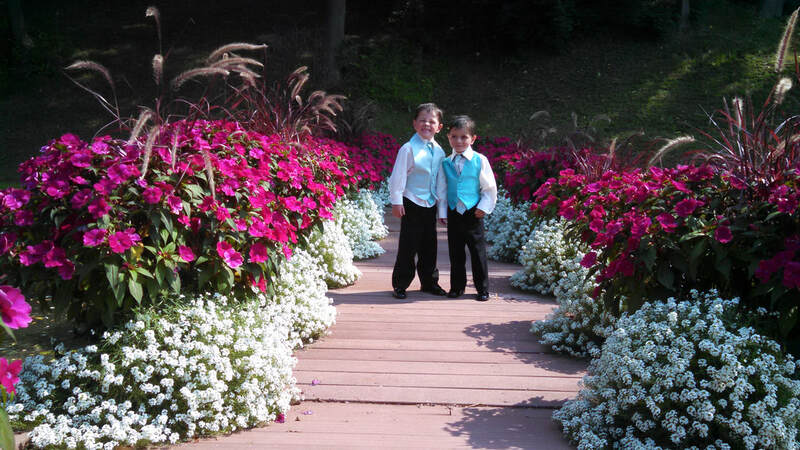 The 17 acre garden estate of Schedel Arboretum & Gardens is the perfect location for a dream outdoor wedding. There are six beautifully landscaped and versatile spaces located in either the Traditional Garden or the Japanese Garden areas. 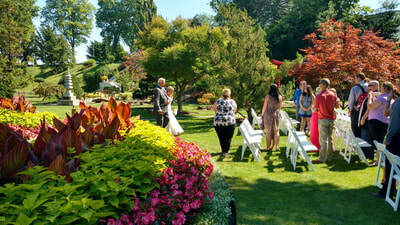 Outdoor ceremonies may be held any day of the week May- October (other months may be available upon request). Ceremony size may range up to 300 guests. Traditional wedding area A large clearing nestled in the lower level of the gardens can accommodate seating for up to 300 guests. The gardens and lakes on the lower level create a gorgeous backdrop. The stroll from the upper level and through the Japanese garden to the congregation seating area is not only a beautiful journey, but a calming experience for guests in preparation for the solemn occasion. Golf cart service is available for guests requiring assistance. Japanese Garden The Japanese Garden can accommodate congregation seating for up to 300. The lush greens, reflecting pool, and splashes of color in the area provide a serene and peaceful backdrop. The water features — the sound of which, in Japanese culture, signifies the mystic passage of time — and statuary add peace and beauty sure to create lasting special memories. All ceremony rentals include: white, chapel style wooden chairs and set up for up to 150 guests (additional chairs on rental basis), a changing area for the bride and her maids, a one hour rehearsal the day prior to the ceremony, and photography time following the ceremony. Standard 110 volt electric is available at all ceremony sites. A room with a view… Enjoy the beauty of the gardens from indoors. Imagine guests strolling through natural beauty to the reception located just steps from a lovely garden wedding ceremony. The Veh Conference Center is the perfect setting for an intimate wedding reception with capacity for up to 90 guests. A key feature is the spacious attached deck that accommodates additional seating, and is a perfect spot for a bar service. Guests will enjoy a sky view of the tranquil gardens with cocktails and air conditioning while the bride and groom capture the first moments of their recent “I do’s”. Also ideal for showers and rehearsal dinners. 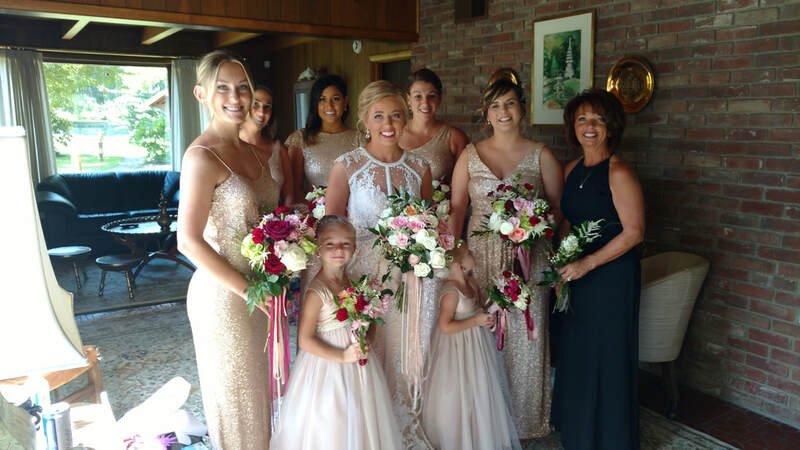 The SA&G event planner will work to customize the details of the event and coordinate access to the extensive list of preferred and experienced vendors (see Preferred Vendors tab). 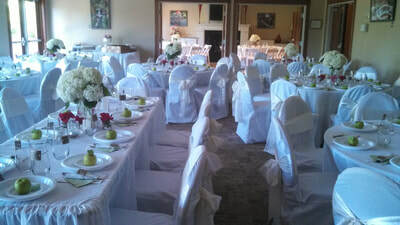 Preferred caterers provide unique specialized menus to fit any theme, budget and cuisine. The SA&G has a full D-5 Liquor License and professional bartenders, along with flexible and well-priced options for beverage service. 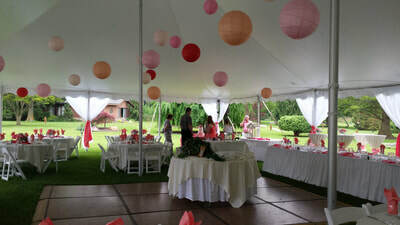 An assortment of service items may be included or are available at additional cost including round or banquet tables, chairs, chair covers, high top tables, linens and glass service. Sixty inch hi-definition monitors and audio video connections are available for personal slide shows, Power Point, iPod connection, CD’s and sound options. Admission to the grounds for all guests is included. The Veh Conference Room is available year round. Lush gardens, rare plant specimens, and a variety of unique flora capture the natural, unparalleled beauty and create just the right romantic environment. The place “where peace and enchantment bloom”. What better location for a dream wedding reception? 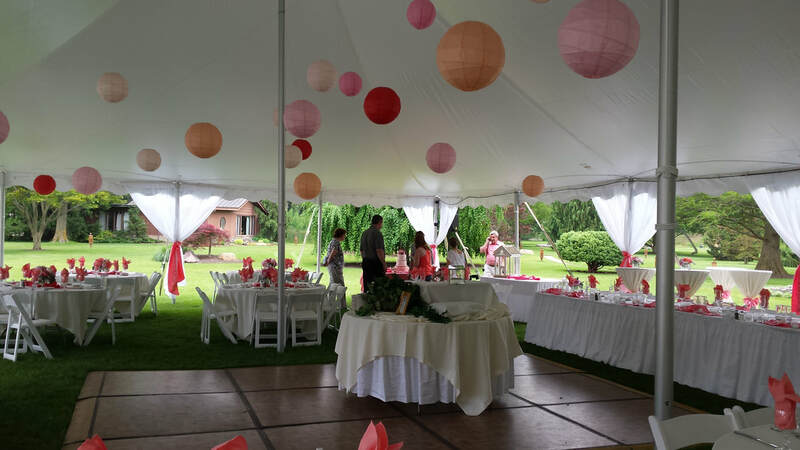 Tented receptions are permitted on the grounds and can accommodate up to 300 guests. 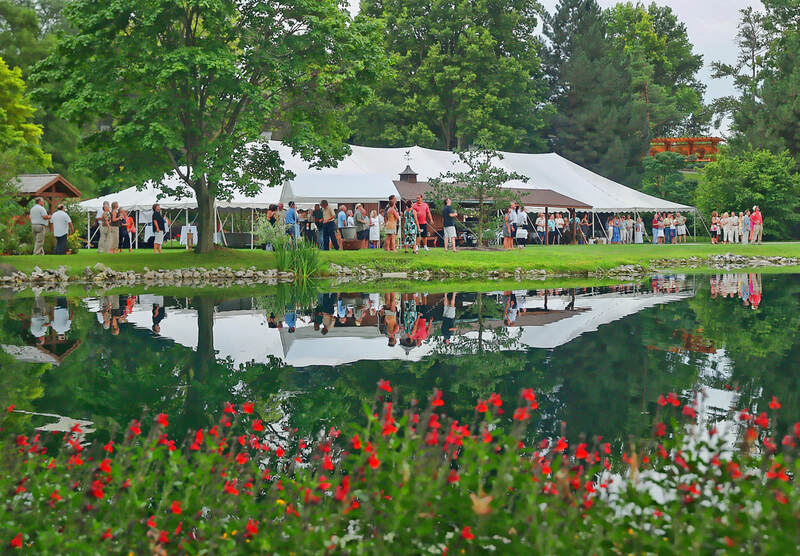 All tents are set in the tranquil setting of the Japanese Garden near the Fisher Lake. Guests are welcome to explore the gardens throughout the event. Reception rental fees include: Grounds use for up to 4 hours – event must conclude by 10:00 pm; the use and placement of 150 white, chapel style wooden chairs (additional chairs available for a rental fee); standard 110 volt electrical hookup; limited golf cart service for handicapped and elderly guests; and, guest parking.